Have a question we haven't answered here? Call our customer service M-F 8am to 4pm. We invite you to email us with your question (photos, recipes, etc) and we'll routinely list it here! Save time, energy and money while eating better food. Plus, you're likely to know exactly what you’re feeding your family. Whole grains, such as wild rice or barley take no longer than 25-30 minutes in the pressure cooker, compared to an hour on the stove. A whole chicken cooks in 25 minutes. Shorter cooking time saves energy. It can also mean savings when cooking with dried beans and whole grains, which are less expensive than canned products. A study in the March 2007 issue of the Journal of Food Science found pressure-cooked broccoli retained 90 percent of its vitamin C compared to 78 percent when steamed, and 66 percent when boiled. By using very little water to cook, built-up steam stays inside the pot with the food and all of the beneficial nutrients. The lack of air keeps the flavors intact and colors vibrant. Indeed, it's a handy item in the kitchen. 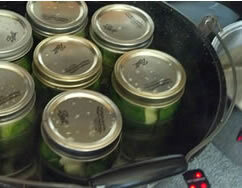 Water-bath canning is the easiest way to preserve food at home. Acidic foods (with a pH of 4.6 or lower) can be processed in a water-bath canner. Jars and the contents within are processed at water's boiling point of 212 degrees Fahrenheit, destroying molds, yeasts, and bacteria that cause spoilage. Perhaps you're passionate about truly saving money, time and electricity. For these savings and when you're ready to eat more-nutritious foods, you'll graduate to pressure canning. You can preserve all kinds of foods with a pressure canner. From stew venison, roast beef, duck, and chili to green beans, okra, beets, sweet potatoes, and asparagus, there's enough mouth-watering meat, poultry, soups, stews, sauces, and vegetables to keep you preserving food all season. Pressure canning is used to kill food-bacteria and associated micro life through increasing pressure to bring water's boiling point to 250 degrees Fahrenheit. Since high acid food bacteria are not a problem, there's no reason to use a higher temperature. For low acid foods, problem microorganisms can be eliminated by processing at 250 degrees for a certain amount of time. This heat is achievable at home using the pressure canning method. Since the mid-1900s we've known this temperature kills the really nasty bacteria that cause things like botulism or food poisoning. According to the July 2013 Mother Earth News Issue, the Center for Disease Control and Prevention has been tracking botulism since 1973 and the 2011 report cited no deaths and only two cases of canning-related botulism. For this type of food poisoning the risk is considerably low. Once you learn the basics and follow tested time and pressure home canning standards, you can focus on enjoying seasonal flavors of watermelon pickles, mint jelly from apple juice and sour kraut despite the season. According to Massachusetts State College in a June 1944 study of process times for home-canned foods, Clostridizcm botulism is the hardest to destroy and causes botulism. Salmonella and Staphylococcus are also noted to spoil preserves processed improperly, according to Mrs. Wages Home Canning Guide and Recipes. Canning may have been risky for our grandparents. Problems with old equipment that wouldn't be tested until it was way over due (how close was the nearest land-grant university, again?). What's more? Canning methods have been tested, retested, and tested again to prove beyond reasonable doubt we can trust standards of canning safety. After more than a century, pressure cooking and canning is predictable and virtually foolproof if instructions are followed correctly. Variations for time and pressure can also deteriorate nutrients and taste of the food inside. Today, the equipment is far better and finding available factory made model-specific replacement parts, if you shop with us, is a breeze. Read the instruction book that came with your pressure canner or cooker and practice assembling it properly. Use trusted recipes for pressure and proper cooking times. Add required liquid first to the cooker/canner then add food or jars. Canning? Start small with six jars of jam or jelly. Have a large clean area for working because canning takes a lot of space. Be prepared with everything you need. Hold cover toward a light and look through the vent pipe to make certain it is open and unclogged. Then place the cover on the cooker and secure it tightly. Place the pressure regulator on the vent pipe. Adjust heat to maintain slow and steady rocking motion or steam release. Let the pressure escape on its own after removing from heat, unless otherwise stated. The pressure is reduced when the air vent/cover lock has dropped. All stainless steel pressure cookers can be used on induction stoves (this includes glass-top stoves). 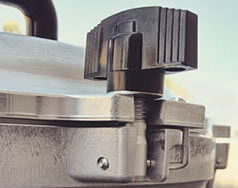 The full Presto cooker and canner line is approved for use on glass-top stoves (this includes their aluminum cookers). The Chef's Design pressure cooker line is all stainless steel and approved safe for induction stove use. The Ball water-bath canner is the other product approved for induction stove use. There are 10 pressure cookers, 2 pressure canners and 1 water-bath canner that are safe for glass top stoves. Measured from the point at which the correct level of pressure is reached. Achieving a pressure is dependent on type of food in the cooker / canner and will vary with each recipe. Always use a timer. Use high heat to bring the pressure kettle up to pressure desired. Then reduce the heat to maintain a steady level. As altitude increases, the atmosphere's pressure decreases, and the temperature to achieve water's boiling point decreases. According to the Official Presto Pressure Cooker Cookbook, cooking times should be increased by 5% for every 1000 feet above 2000 feet in altitude. Use a cooking / canning rack when you desire to keep all or some food out of the cooking liquid. Foods kept out of the cooking liquid maintain their unique flavor. Not using the cooking rack or basket allows flavors to intermingle. Presto's official pressure cooker cookbook approves oven-proof glass, metal, and ceramic dishes. Dishes should be filled two-thirds full to allow for the expansion of foods and fitted loosely into the pressure cooker, rack, or in the basket. A small or large quality of food may be cooked with the same fine results. The outside may be kept bright and shiny with a good silver polish or simply washing with warm soapy water. Iron and other materials in food and liquids can darken the interior of a cooker or canner, although will not affect the food being cooked in any way. These harmless stains may be removed by using a solution of water and cream of tarter. Enough should be used to cover the discoloration when poured (not filling more than 2/3 full), then close the cover securely. Heat until pressure regulator rocks gently. Remove cooker from heat and allow to stand 2-3 hours. Remove regulator and cover, empty contents and scour thoroughly with a steel wool cleaning pad containing soap; wash, rinse and dry. Aluminum is lighter weight, lighter in color, and the best conductor of heat. Stainless Steal is heavy duty with a nice and shiny appearance that is more resistant to wear and abrasion. Be sure the condition of equipment is good. Faulty gauges, pressure sealing gasket rings, or jars can cause food to process incorrectly. Get your equipment together, laid out, and within reach. Mid-way though pickling isn't the time to remember you forgot lids and bands. Cheese Cloth loosely woven cloth to be used as a spice bag or as a strainer to separate pulp from juice. Induction Stoves heat a cooking vessel with induction heating, instead of traditional heat transfer from electrical coils or a gas flame. For nearly all models of induction cook tops, which include glass-top stoves, a cooking vessel must be made of a magnetic metal such as cast iron or stainless steel. Copper, glass and aluminum vessels can many times be placed on an interface disk which enables these materials to be used.